High fashion is sleek and has an undeniable air of elegance about it — which is exactly what this theme is all about. It’s also a responsive theme that’s easy to customize, giving the user liberty with regards to typography and color controls. You can even adjust the sidebar width and have access to brilliantly powerful shortcodes on top of the many element options in terms of menu position, custom image page dividers, post style, SEO optimization, and custom CSS editing. If you’re all about a simple, minimalistic look and clean lines, white space, and modern typography, you will love this theme. Created and designed to fit both function and entertainment genres, DeVoe sports a more striking, more image-centered look. Contrary to the minimalist, simple, and generously white-spaced modern fashion themes that seem to make the trend these days, this theme will spoil your eyes with a rich, full-screen image-laden background. You can choose from a handful of layouts and full-screen background options to boot. Another aspect where this theme is a standout is its right-hand, fly-out navigation pane as the default menu. 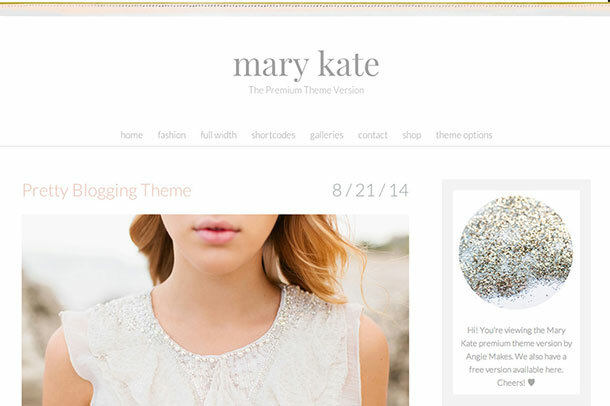 This well-thought of theme has been voted as “best theme available” — which to us, does not come as a surprise. Aside from the fact that it looks and works exceptionally great on mobile with brilliantly done typography and spacing everywhere you look, it also sports some impressive and skillfully cooked CSS3 effects which enhance, not overwhelm overall user experience. 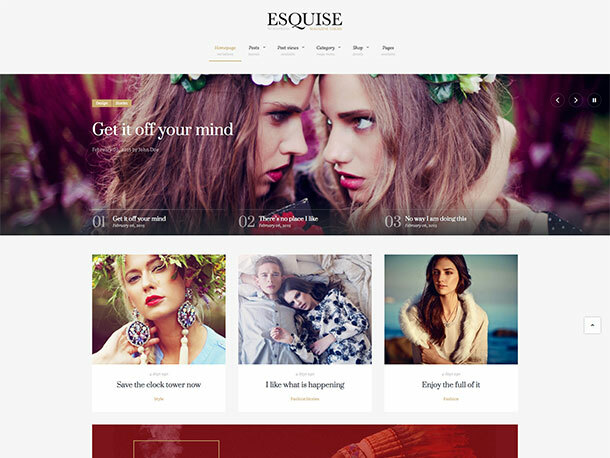 Esquise is built on Bootstrap and is compatible with both WooCommerce and WPML. It’s also retina-ready, which is great if you’re trying to keep up with the tides of technology. 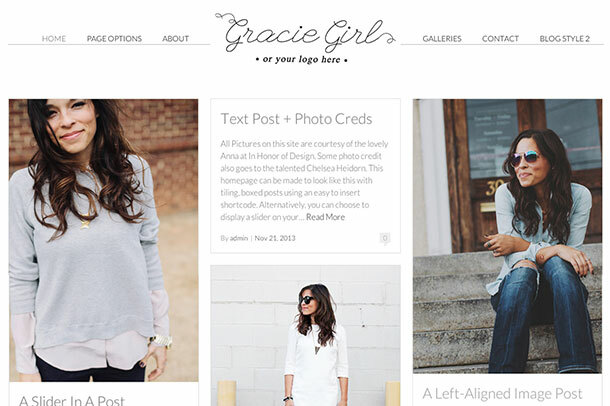 If you’re a fan of centered logo images or texts and taglines that are smoothly embedded in the menu, you will without doubt fall in love with Gracie Girl fashion blog. It’s a very customizable theme that provides many advantages for all sassy fashion aficionados out there. There are many homepage options which include a static homepage, homepage carousel slider, tiling mosaic gallery post, and a simple but good-old-reliable standard blog format. Users also have the liberty of choosing and/or managing the typography, post style, custom image page dividers, SEO optimization, and CSS editing. Lovers of dainty, pastel, and feminine hues will be drawn to the clean and pretty default feel of this theme. On top of that, there are a number options for customization if you should fancy adding your own spin to it. There are a number of available color and typographic controls, an adjustable sidebar width and a handful of shortcodes that you will appreciate greatly especially if you only have time and energy for picking out colors and uploading your uber sassy and posh ootd posts. 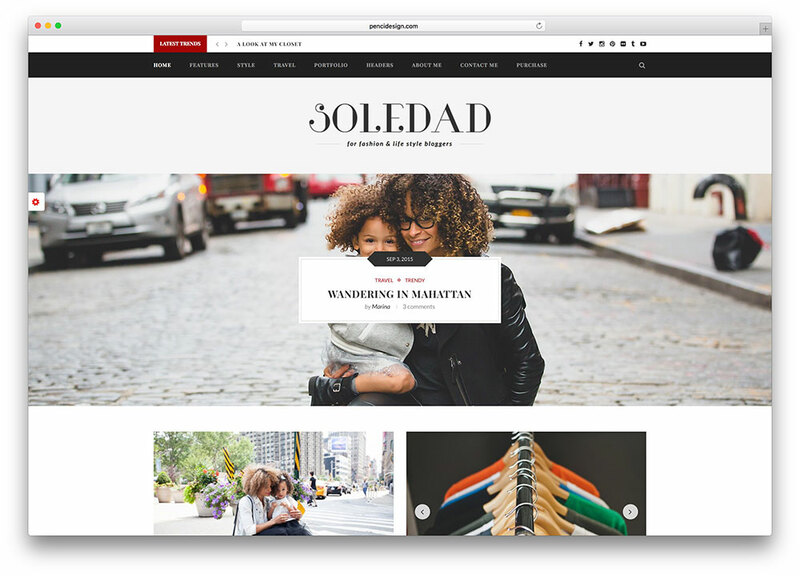 Users who have been bitten by the travel bug and have developed an itch for blogging about it will like this creatively done, easily navigated, breezily customizable theme. 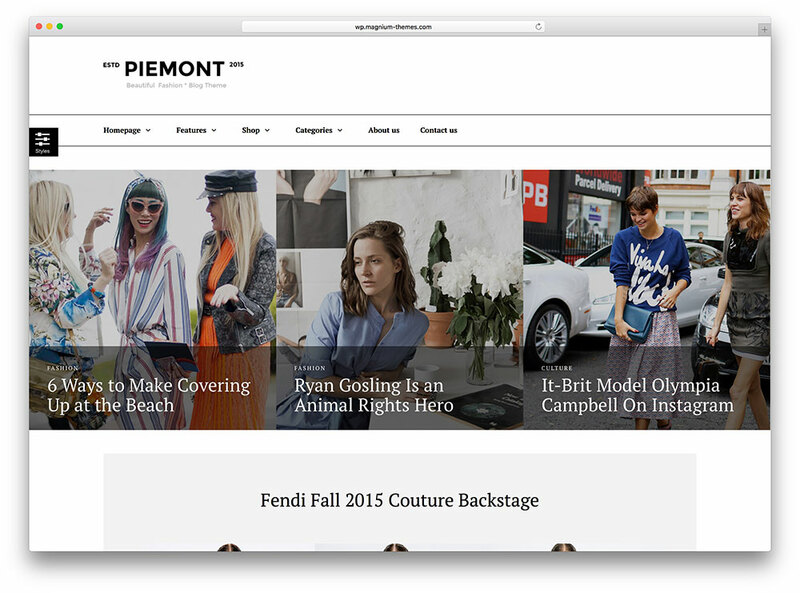 Piemont is highly recommended for everyone — even for bloggers who are not exactly tech and programming savvy. If your blog’s peg is modern, fashionable, and sleek — this is the perfect theme that will give your little cyberspace the attention it rightfully deserves. Sleek sports a brilliantly done layout that creatively utilizes every bit of screen real estate without being tacky and overwhelming. 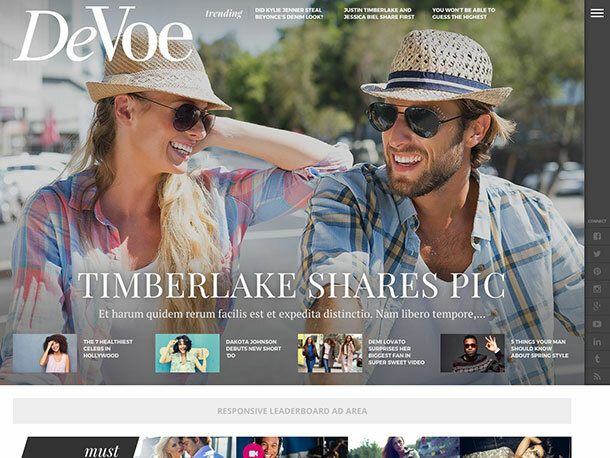 Its smooth and breezy performance across all devices also makes it quite a steal if you’re looking for a highly responsive magazine and fashion blog theme. There are 5 layout options you can choose from, namely: Newspaper, Minimal List, Masonry, Carousel, and Slider. Soledad is as beautiful as its name sounds. And as if that shouldn’t be the only consideration you make when picking out a fashion-conscious, aesthetically lovely blog, it’s also flexible enough to make sure that it’s tweakable up to the last page template! It’s a great choice theme for fashion blogs, but it’s also colossally adjustable which makes it a great one for many other diverse niches. Here’s a theme that won’t just make your blog nice to look at, it’s also one that makes maintaining it a breeze. That’s on top of its user-friendliness, uniqueness, and easy-to-understand features and design. 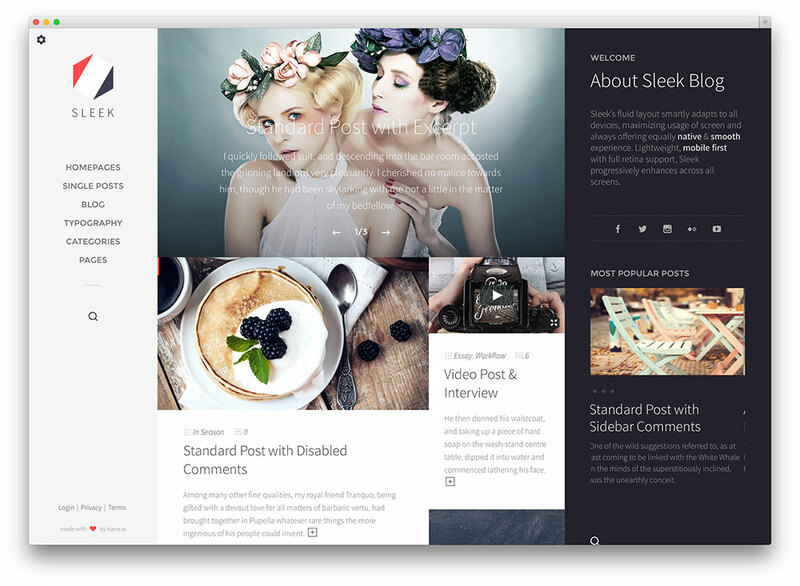 Who doesn’t like a responsive blog theme based on the powerful Bootstrap framework? 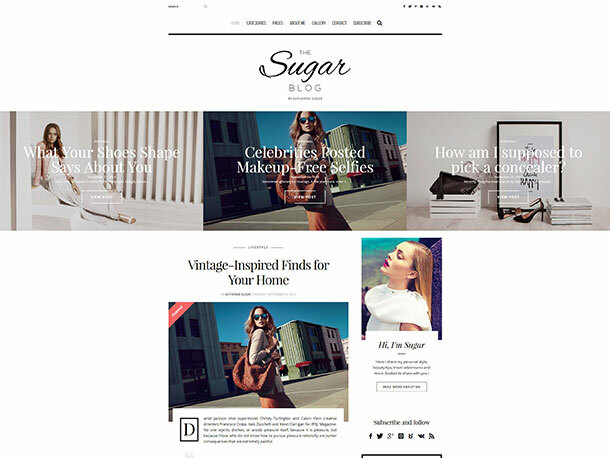 On top of that, Sugarblog theme also has 11 home blog layouts, tons of color options, and four built-in header layouts. There are even 9 custom page templates alongside a lightbox, and more than 8 options for customized widgets that support full-size Instagram content. Why choose between quality and aesthetics? 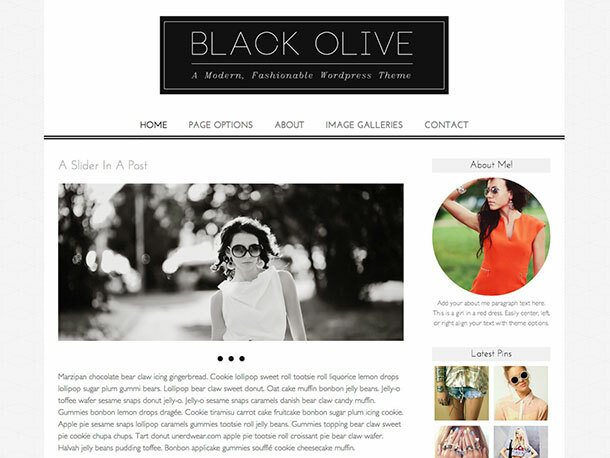 The Brand blog theme lets you have both! Whether you have a boutique, a clothing line, or cosmetic and fashion products to showcase, this theme is a great pick. Aside from its jawdroppingly awesome features, it’s also built on the Bootstrap 3.x. Not too impressed? You’re talking too soon — The Brand is built to fit itty-bitty screens on mobile devices — which makes your blog pretty relevant regardless of which device your customers/audience are using!